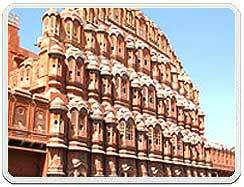 Rajasthan the biggest state of India has Jaipur as its capital. It has 32 districts. The Aravali hill Range runs across the state from Mount Abu, which is 1,722 m in height to Khetri. Most of the area of Rajasthan is covered by Thar Desert. The state Rajasthan economy is mostly agricultural and rural. Sugarcane, pulses, oilseeds, cotton and tobacco are the main crops of the state. The Indira Gandhi Canal irrigates the northwest Rajasthan of India. 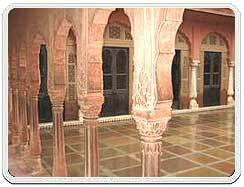 Rajasthan is also the largest producer of marble and stonework. It is mined at Makrana near Jodhpur. Rajasthan has rich salt deposits at Sambhar and copper mines at Khetri and Dariba. Many old and neglected palaces and forts have been transformed into heritage hotels. The palaces of Jaipur, lakes of Udaipur, temples of Bikaner and desert forts of Jaisalmer are the beloved spots of tourists, both Indian and Foreign. Mount Abu is the only hill station of Rajasthan state. The famous Thar Desert is also situated Rajasthan. Enjoy Rajasthan tour in a land of swelling sand dunes, impressive Rajasthan palaces and majestic forts. Stay at exotic palace hotels on your Rajasthan tour. The magical land of Rajasthan is holy with several fascinating places that have never unsuccessful to appeal the travelers, since time everlasting. The appealing touring destination, Rajasthan is a home of rich tourists' attraction that presents cultural, rural, wildlife, adventure, game, and heritage Rajasthan tourism. Come here to observer the rich historical treasure, picturesque architecture and the stunning landscapes, which is an unparallel touring goal in the entire globe. 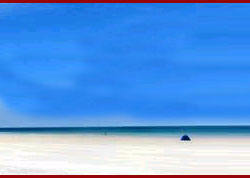 Also, the exotic land of the shimmering sands presents nice chance to witness the Thar Desert in Rajasthan. Although exploring in Rajasthan, we will help you to view the stunning places of the state. We are known for our outstanding Rajasthan tours. The origin of the Rajputs remains somewhat in doubt. That they were of foreign origin is suggested by the elaborate genealogies that the Brahmins (the priest of the Indian Varna or caste system) created to accord them the Kshatriya (warrior) caste. Which status they always insisted upon with almost undue vehemence. The Rajputs traced their lineage from a mythical fire atop Mt Abu, a mountain in Rajasthan, (Agni Kula or the Fire Family), the sun (Suryavanshi or the Sun Family) and the moon (Chandravanshi or the Moon Family). Whatever their lineage, the Rajputs certainly were the living image of the knightly noble; handsome, brave � almost foolhardily so � and living within an elaborate code of honour and chivalry. Even then the attitude towards the British rule were varied and after the quashing of the 1857 Mutiny and the establishment of the British Indian Empire, the Rajput Princely States gained importance with 21 gun salutes, royal polo matches and durbars, just as they lost its meaning. Yet today the spirit and the heroic exploits of famous Rajput warrior-kings, like Prithviraj Chauhan, Rana Kumbha, and Bhappa Rawal, continue to echo in the golden sands of Rajputana in the people�s folklore, music and dance. When India became independent 23 princely states were combined to form the State of Rajasthan or the abode of rajas and now has become the foremost destination in India. The privy purses were compensatory financial packages given to the Maharajas of the various independent states of India when they gave up their titles and chose to join the Indian union. However in 1971 Prime Minister Indira Gandhi, who was well known for her socialist ideologies, abolished the privy purses alongwith all titles in what is still viewed as a controversial move. The State has an area of 343,000 sq km. The capital city is Jaipur. The Aravali Range runs across the state from southwest Guru Peak (Mount Abu), which is 1,722 m in height to Khetri in the northeast. This divides the state into 60% in the north west of the lines and 40% in the southeast. The northwest tract is sandy and unproductive with little water but improves gradually from desert land in the far west and northwest to comparatively fertile and habitable land towards the east. The area includes the Great Indian (Thar) Desert. The south-eastern area, higher in elevation (100 to 350 m above sea level) and more fertile, has a very diversified topography. in the south lies the hilly tract of Mewar. in the southeast a large area of the districts of Kota and Bundi forms a tableland, and to the northeast of these districts is a rugged region (badlands) following the line of the Chambal River. Rajasthan is a northwesterly state of India. It is bound on the west and northwest by Pakistan, on the north and northeast by the States of Punjab, Haryana, and Uttar Pradesh, on the east and southeast by the States of Uttar Pradesh and Madhya Pradesh, and on the southwest by the State of Gujarat. The main geographic feature of Rajasthan is the Aravalli Range, which runs through the state from southwest to northeast, almost from one end to another end. Hindi, Rajasthani, Marwadi and urdu. Rajasthani is divided into four big groups, the biggest being that of Marwari. Standard Marwari is spoken mainly in and around Jodhpur district and has some influence on the dialects in Barmer, Jalore, Pali and part of Nagaur district. The dialect is also spoken in mixed form in the east in Ajmer, Udaipur, Bhilwara and Chittorgarh district; in the south in Sirohi district and the Palanpur district of Gujarat; in the west in Jaisalmer district and in the north in Bikaner, Churu, Sikar and Jhunjhunu districts. It is also spoken with some Punjabi influence in Ganganagar district in the north-west. In the south-east in Mewar (Udaipur, Bhilwara and Chittorgarh districts) and its neighbourhood, there is the well-known eastern form of Marwari known as Mewari. In the southern part of Pali and Jalore districts, the whole of Sirohi district and the northern part of Palanpur, there is a southern sub-dialect. The dialect spoken in the western parts of Barmer, Jaisalmer, Thar and Parkar areas of Sind is called Thali in the north and Dhatak in the west. Northern forms of Marwari cover Bikaner, Churu, Ganganagar, Sikar and Jhunjhunu districts. In Bikaner it is called Bikaneri while in the north-eastern part of Churu it is known as Bagri. The second big group of Rajasthani is formed by eastern Rajasthani or Jaipuri, better known as Dhundhari. It covers the districts of Jaipur, Tonk, Kota and Bundi and parts of Kishangarh, Ajmer and Jhalawar. In the north-east, Eastern Rajasthani has the Mewati dialect of the same language, while further east, from north to south, it is Braja Bhasha in Bharatpur, the Dang sub-dialect of Braja Bhasa in Sawai- Madhopur and Karauli, Bundeli and Malvi in Jhalawar and the southern parts of Kota. Urdu (ūr'dū) , language belonging to the Indic group of the Indo-Iranian subfamily of the Indo-European family of languages. The official tongue of Pakistan, Urdu is also one of the 15 languages recognized in the 1950 Indian constitution. Urdu has been described as the written or literary variant of Hindustani that is used by Muslims. It is written in a modified form of the Arabic alphabet, and its basically Indic vocabulary has been enriched by borrowings from Arabic and Persian. Grammatically and phonetically, however, Urdu is an Indic language. About 100 million persons in Pakistan and India understand Urdu. Urdu (اردو) is an Indo-European language of the Indo-Aryan family that developed under Persian, Turkish, and Arabic influence in South Asia during the Delhi Sultanate and Mughal Empire (1200-1800). Taken by itself, Urdu is approximately the twentieth most populous natively spoken language in the world, and is the national language of Pakistan as well as one of the 24 national languages of India. There are between 60 and 80 million native Urdu speakers. Overall, besides the more than 160 million who speak Urdu in Pakistan, there is considerable Indian population who communicate in Urdu everyday. Some scholars think that Urdu has had such an impact on the Hindi of India that Hindi in itself has evolved into Hindustani, a blend of Hindi and Urdu. It is believed that most Indians speak Hindustani. In Pakistan, Urdu is spoken and understood by a majority of urban dwellers in such cities as Karachi, Islamabad, Lahore, Rawalpindi, Peshawar, Quetta, Hyderabad, Sialkot, Gujranwala, Faisalabad, Multan and Sukkur. Urdu is used as the official language in all provinces of Pakistan. It is also taught as a compulsory language up to high school in both the English and Urdu medium school systems. This has produced millions of Urdu speakers whose mother tongue is one of the regional languages of Pakistan such as Punjabi, Sindhi, Pashto, Gujarati, Kashmiri, Balochi, Siraiki, and Brahui. Urdu is the lingua franca of Pakistan and is absorbing many words from regional languages of Pakistan. The regional languages are also being influenced by Urdu vocabulary. Most of the nearly five million Afghan refugees of different ethnic origins (such as Pakhtun, Tajik, Uzbek, Hazarvi, and Turkmen) who stayed in Pakistan for over twenty-five years have also became fluent in Urdu. In India, Urdu is spoken in places where there are large Muslim majorities or cities which were bases for Muslim Empires in the past. These include parts of Uttar Pradesh, Delhi, Bhopal, Lucknow, Hyderabad, Bangalore, and Mysore. Some Indian schools teach Urdu as a first language and have their own syllabus and exams; Indian madrasahs also teach Arabic as well as Urdu. India has more than 2900 daily Urdu newspapers. Newspapers such as Daily Salar, Daily Pasban, Siast Daily, Munsif Daily and Inqilab are published and distributed in Bangalore, Mysore, Hyderabad, and Mumbai. Urdu is also spoken in Kashmir and urban Afghanistan. Outside South Asia, it is spoken by large numbers of workers in the major urban centers of the Persian Gulf countries and Saudi Arabia. Urdu is also spoken by large numbers of immigrants and their children in the major urban centers of the United Kingdom, the United States, Canada, Norway and Australia. Explore Rajasthan - the Desert Jewel of India. This is a royal land bejeweled with invincible forts, magnificent palaces, rich culture and heritage, beauty and natural resources. This abode of kings spread across the great Thar Desert is India's ambassador to the world of travel and tourism. Rajasthan being a major tourist destination in India, the state is well connected with other parts of the country and is well accessible by air, rail and road. Delhi, the capital of India and most important international gateway is conveniently located at 4 hours distance from Jaipur, the Rajasthan capital. Rajasthan has an extensive network of railway that connects it to all of northern India as well as other destinations too. The Palace of Wheels is a luxurious operated by Rajasthan Tourism that is royal train where you are treated like a king. An excellent network of highways link Rajasthan with Delhi and regions of Uttar Pradesh, Madhya Pradesh, Gujarat and other cities as well.